The rear washroom in our Sterling Celebration 550 has one blown air heating vent, and it does take a while to warm up. Additionally it would be nice to be able to have somewhere to hang towels to dry out. I had been on the lookout for a small electrically heated towel rail for a while. I wanted something that was small, fairly light weight and importantly only a low wattage. I didn’t need to heat the washroom to 90 degrees, just keep it aired. I eventually found a 60 Watt swivel towel warmer from Adige for £49.99 plus VAT. By choosing to keep the wattage low, it was a little more environmentally friendly, hopefully it would keep the washroom aired without the need to keep the heating on and when we are on sites that have a limited EHU supply, we could still use it without tripping the bollard every time we turned something else on as well. The next thing I needed was a suitable way of switching it on and off with some indication from the caravan when it is on. 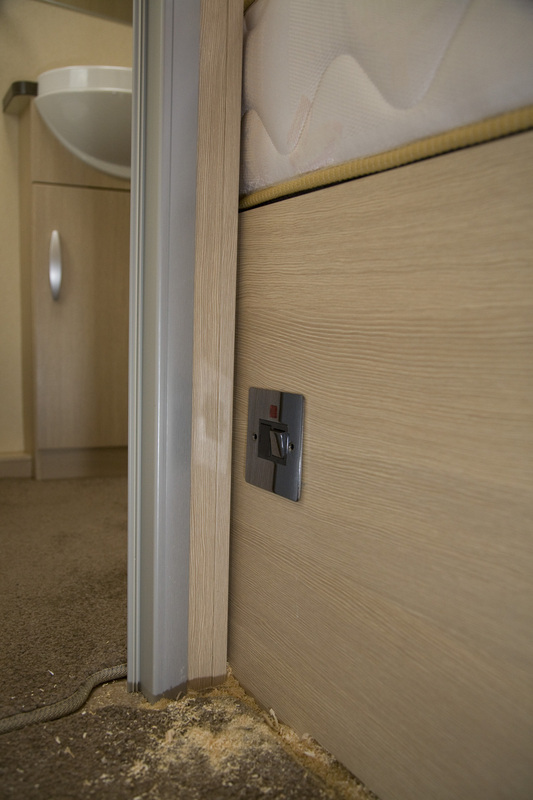 I looked at the CBE range of fittings, which are standard to Sterling caravans and finding out the price and availability, I soon discounted them. I called im my local B & Q and found a suitable switched fused outlet with a neon indicator in black chrome. I intended mounting the switch on the side of the bed base, just outside the door to the washroom, so it was visible, but unobtrusive. 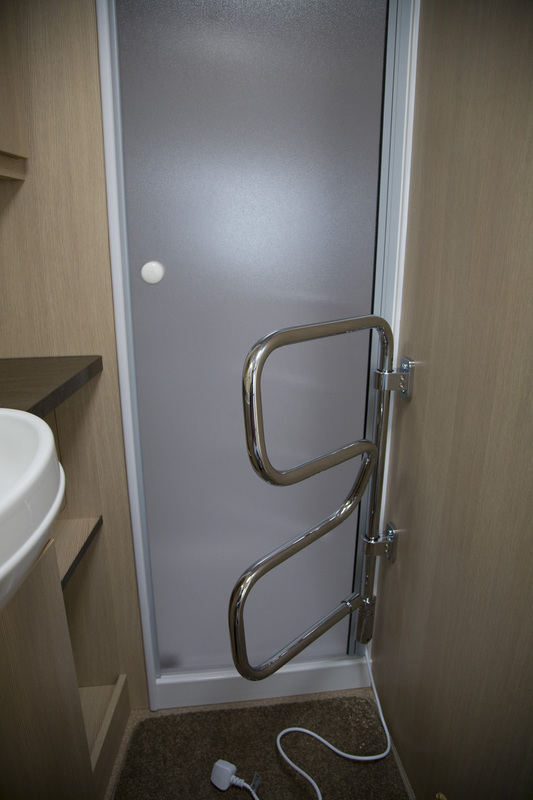 I also wanted to make sure that I was not affecting anything structural in the caravan by installing the switch or towel rail. The towel rail mounting is via two brackets, that each require two mounting screws. Normally, these would be four wood screws and plugs, but as the wall of the van is only 10mm ply, I wanted something more substantial. I opted to use four M4 pan head bolts and 25mm washers on the back with flat face lock nuts. Positioning the towel rail so that it could swivel across the door of the shower if more room was needed in front of the sink, I marked the position and drilled the four holes. 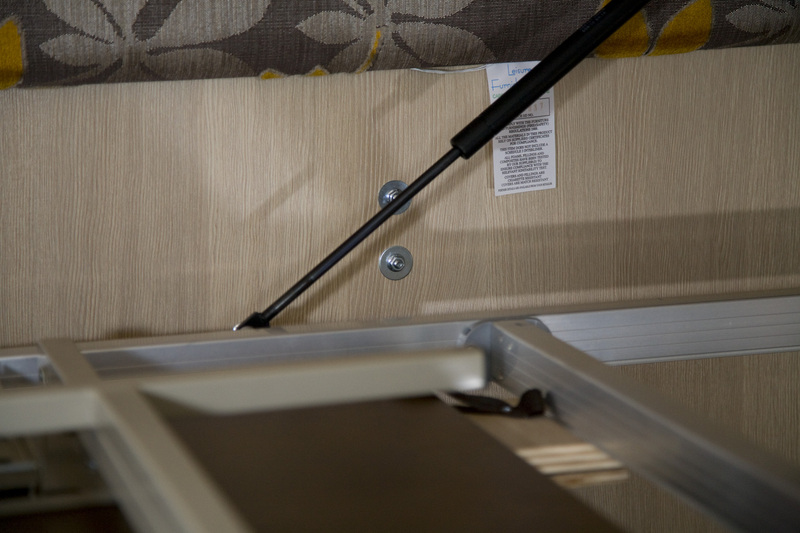 Remember, a caravan is not always level, so don’t use a spirit level, measure off a point in the caravan. In this case I measured 70mm from the shower door frame to make sure it was square. Before drilling, I removed the headboard from the other side of the wall. It is fixed into position by two long lengths of velcro. Once the towel rail was fixed into place, I cut off the plug that came pre fitted. I removed the fuse from the plug, to use in the switched fused outlet as I assumed it would be 3 Amps. It was however a 13 Amp fuse. A 13 Amp fuse should not have been supplied with the towel rail, it’s only 60 Watts so a 3 Amp fuse would have been sufficient. To feed the cable under the bed, a small hole was drilled just below the cable exit point from the towel rail. In order for it to swing, a sufficient loop was left in the cable so it would not strain when moved. 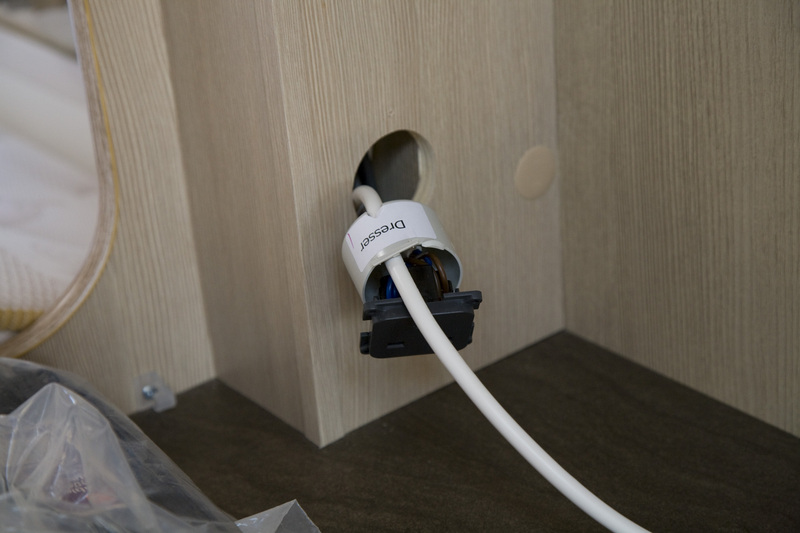 Now we have the cable from the towel rail under the bed, we can look at installing the switched fused outlet. 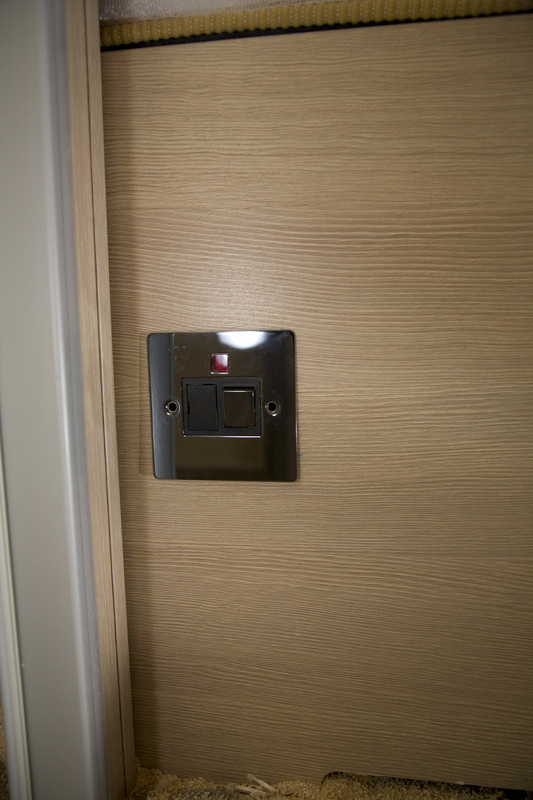 The unit I had bought was a flush fit faceplate, the idea being it would be as unobtrusive as possible. In order to keep it flat to the surface it was being mounted on, I elected to mount the back box behind the wood panel, rather than through the panel. This required some precise cutting using a hole saw and a sharp craft knife to gently shave the sides until a perfect fit was achieved. The cable from the towel rail was fed through the back box, along with a 2.5mm cable that would be the supply to the switched fused outlet. The cable was passed through the newly made opening and terminated on the switched fused outlet, making sure to note the load and supply sides of the fitting. The front faceplate and rear mounting box were then offered up and held in place by the normal two face plate fitting screws. You will probably need to get slightly longer screws than are supplied with the faceplate. 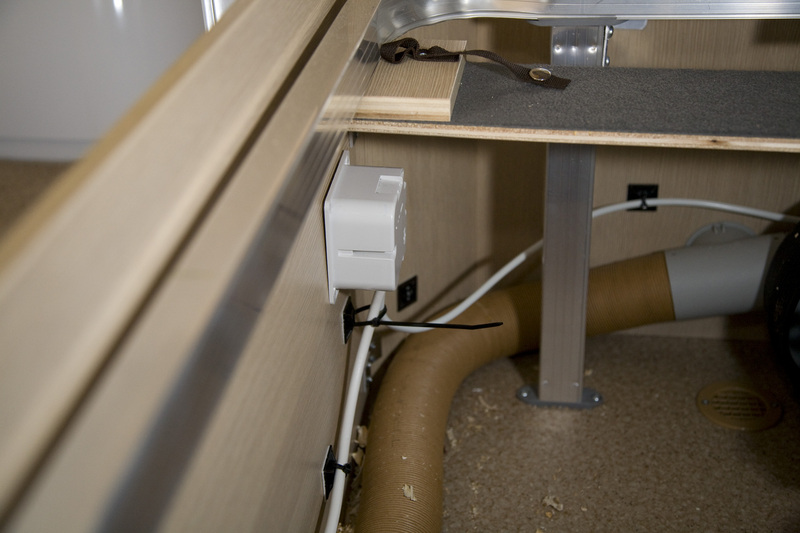 The cable was routed around the inside of the under bed storage area and held in place with sticky cable pads and zip ties. Once round the under bed storage area, I routed the cable up through the back of the TV unit and up to an existing 13A socket. In the Sterling, this socket and the one inside the drop down TV fitting are supplied on their own Circuit Breaker, so adding an additional spur to the switch fuse outlet is OK. The additional load is only going to be 60 Watts or 0.25 Amps. Once I had the cable fed up through the under bed storage area, I could remove the exiting 13 amp socket in order to add the new 2.5mm feed cable. Removing a CBE type socket is quite simple. There are small slots in the top and bottom of the face plate that you insert a small screwdriver and gently pop off the trim piece, behind that, there are two small screws holding the mounting frame to the surface. Simply unscrew these and the whole thing will come away, exposing the protective back box. As there were already two 2.5mm cables going into the socket, I thought this was going to be a bit of a squeeze to get a third one in. In fact, it was quite easy as the terminals could accommodate the three cables easily without any problems. Once the cables were secure, before I reassembled everything I checked all the connections with a digital meter and also checked the earth impedance from the metal frame of the towel rail back to the main 240 volt chassis earth. All the readings were OK. 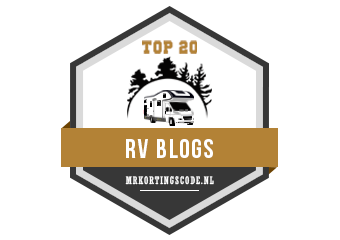 When the caravan is hooked up to 240 volts I’ll do another check on the Circuit Breaker too. So, that’s it, around two hours work including coffee and a bacon & egg sandwich fetched from the local cafe by Sue we now have an electric towel rail. The project cost £77.37 for the towel rail and all the bits and pieces. I’m sure it could be done for a little less as there are cheaper towel rails and face plates. I’ll leave you with a few more photos of the project. Hopefully it has inspired you to go and install your own heated towel rail. The only thing left to do now is vacuum up all the debris! This article is very informative and if I may say so a very neat job. We have the same van, albeit based on the Swift Charisma 550, and often encounter the same problem of getting towels dry. I note that the towel rail can swing out across the shower door which obviously gives more room in the toilet compatment. However what happens when travelling, do you secur it in any way? Also have you any idea of the weight? The weight of the towel rail is about 2.2Kg and all the other fittings (switch, cable, bolts etc) will add around another 1Kg. 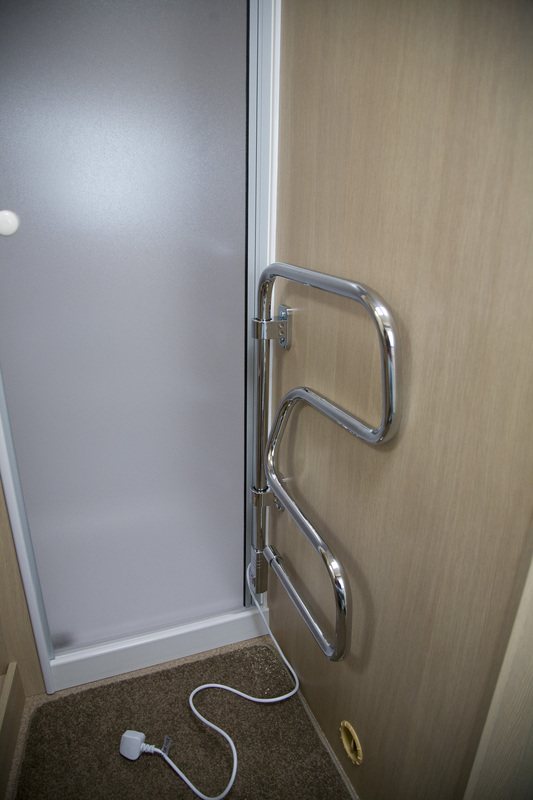 The towel rail is mounted on the centre line of the caravan, and hopefully will make little or no difference to the overall balance. One of the reasons we went for the design, was the ability to swing it across the shower door. The towel rail has some resistance to swinging – the rail is actually held by nylon bushes inside the mounts, so I don’t anticipate it swinging freely in transit, but we will probably travel with a towel threaded through it just in case. If it looks like it is swinging about while travelling, I’ll investigate some form of small webbed or velcro strap to hold it in place. Thanks for the info. Margaret wants one!!! Great article. I have a Sterling elite amber and would like to fit the towel rail. Where under the bed did you enter the cable to route up to the mains electric plug? On our van there is a gap between the plastic wheel arch liner and the panel that makes the ‘room’ divider. There were already a couple of cables passing through the gap for the side marker lights. Once inside, I just removed the socket and used a wire coat hanger to fish the cable up. We have just returned from a week out in the van in Scotland, and summer has gone to wherever summers go. Getting the damp towels dry was a real problem so I have been instructed to fix the problem, and thanks to your excellent article, I can now make Petal happier. One question though, the moisture from the towels has to somewhere. What was your solution please? The heating rate of the towel rail is at a low enough level that doesn’t cause masses of humid air coming off any towels placed on it. Obviously there is some humidity, but this is easily taken care of via the roof vent which has a permanent air flow even when closed. If a washroom can handle the moisture from a shower, drying a couple of towels should not be a problem. Additionally, as we leave the towel rail on when the towels are dry as background heat, this does have a ‘drying’ affect in the washroom. If possible, try to find a route internal to the caravan, 2.5mm2 cable is not too bad to run with a bit of ingenuity. However, if you have to run externally under the floor, then trunking would be recommended. You might be able to use flexible trunking such as ‘Adaptaflex’ and follow the chassis rails around the van. This would allow you to seal the trunking as it passed through the floor and is flexible enough to handle tight bends. http://www.screwfix.com/p/adaptaflex-general-purpose-pack-pvc-pliable-conduit-25mm-grey/76571 or something similar. I think B & Q will do cut lengths. Thank you for posting this very useful and informative article, I have followed your suggestions and have successfully installed a heated rail in our Swift Charisma 550 (which of course is a very similar in layout to your Sterling. I made a couple of changes to your specifications which I thought might present helpful options to other readers. I have installed a 45 watt, ‘HeatThat’ Towel Warmer, which has four independently swivelling horizontal heated bars. This is controlled from a ‘Booster Switch’ timer, providing four push click, timed auto on/off options (in 1 hour increments) plus a manual on/off option, with a blue neon back lit indicator. I have located this in the same position as your switched fused outlet. 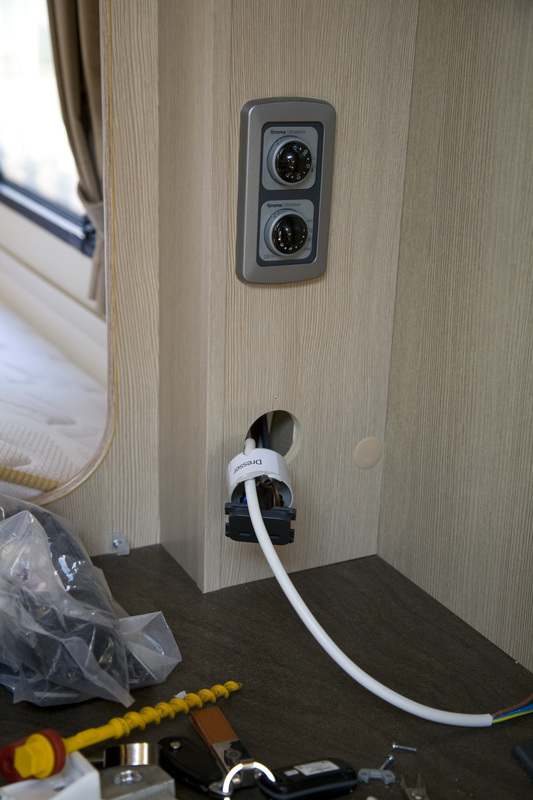 The switched fused outlet (minus a neon indicator light) is installed on the inner side of the wood panel, under the bed. 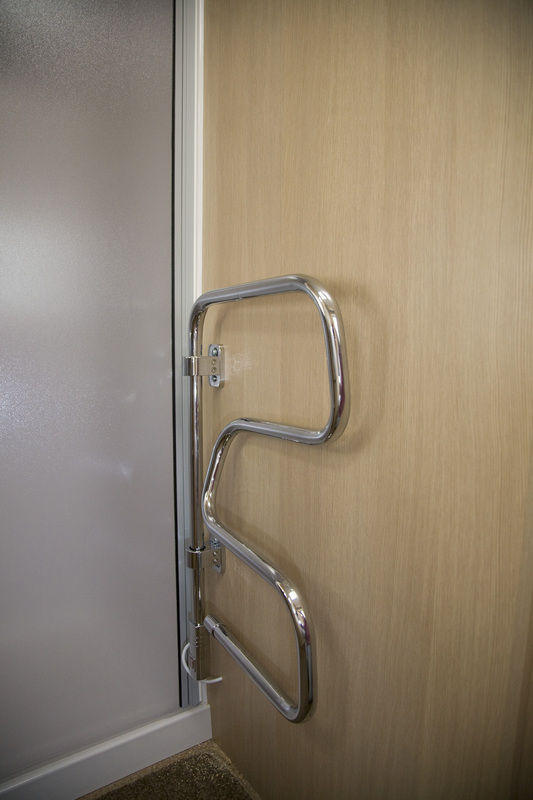 We are very pleased with the result – a very effective, low wattage, self timed, towel heater rail. Photos available if that is of help. Hi Simon, great idea! Have put this in my projects to do file!